The idea of usuryfree local currencies is not new. During the "Great Depression of the 1930's." hundreds of different forms of Depression Scrip" were created and issued into circulation. 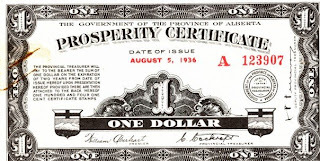 There is much to be learned from researching and reviewing what happened during the "Great Depression of the 1930's" when usury-based, debt money was in short supply. The issuance of "Depression Scrip" became a common practise for individuals, municipal governments, school districts, co-operatives, local manufacturers, merchants and business associations. 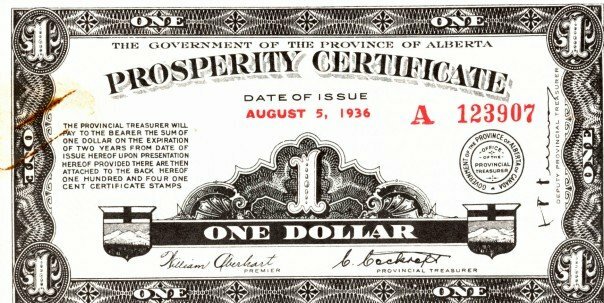 These various types of "Depression Scrip" ranged from certificates, vouchers, bonds and even paper notes of usuryfree, time currency. The webesite "Depression Scrip" has an abundance of information posted for our re-education - because formal education dismissed this information as "not worthy of being taught to students." Below is a paragraph from the title page of the website "Depression Scrip." "The main purpose of this website is to document depression scrip. The last documentation put together on depression scrip was a great book written in 1984 by Ralph A. Mitchell and Neil Shafer. In my opinion, it's the "bible" on depression scrip. But, it lacks a few things. There aren't as many pics as I would like to see. Plus, the pictures aren't as detailed as they could be. I understand the problems with publishing something like that. It would be 12" thick if there was as much detail as I would like to see. Still, it's the best book ever written. My hat is off to Neil Shafer and Ralph Mitchell for the unbelievable amount of research it took to write that book. Because of that book, I have a huge head start in collecting what I'm learning, is a forgotten piece of history. world paper money, national notes, post cards, baseball cards, football cards, records, beanie babies, trains, old books, bottles, etc. Yes, I'm a collecting nut." A good background article for your ongoing research is titled: "Local Money In The United States During The Great Depression."